Thanks to a 15% increase in stand space for 2018, the Natural Food Show is set to host the biggest showcase of natural and organic food and drink the UK has ever seen. Thousands of trade buyers, retailers, caterers and foodservice managers from across the UK, and around the world, have already pre-registered to visit the event, which forms part of Natural & Organic Products Europe. They include representatives from Ocado, Whole Foods Market, Planet Organic, Holland & Barrett, Suma, Revital, John Lewis, Better Food, Debenhams, Boots, Gate Retail, Casual Dining Group, Compass Group, Gather & Gather, and BaxterStorey. 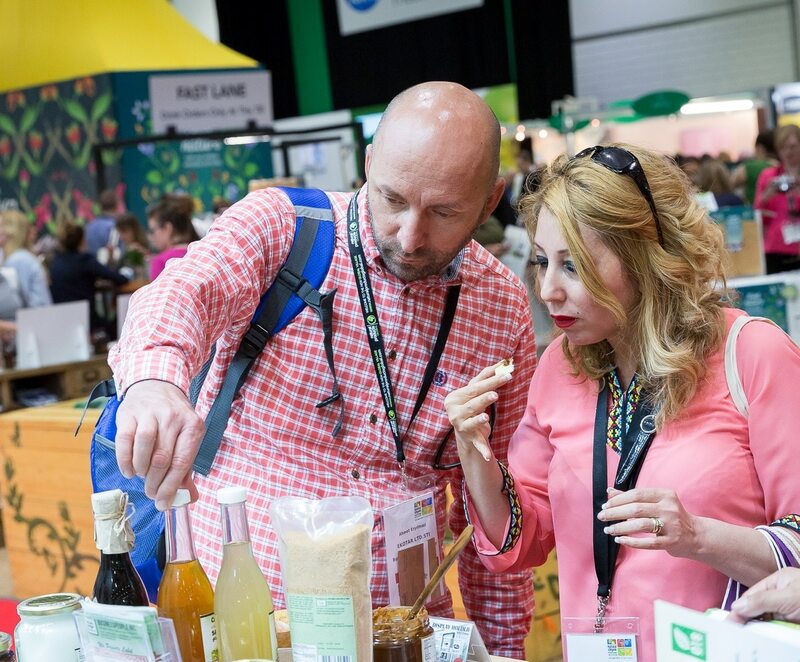 By the time doors open at London ExCeL on 22-23 April, it’s expecting to welcome over 11,000 attendees – all looking to satisfy the world’s growing appetite for high quality, and good value, natural and organic products. Around 60% of Natural & Organic Products Europe’s 700+ exhibitors will be promoting food and drink innovations (the rest – everything from natural health and nutrition to beauty and eco-living products). Over a quarter of these foodie exhibitors are new to the show for 2018. Among them are specialist drinks suppliers, including Thirst Quenchers UK, Kissa Tea, English Tea Shop, Coco Fuzion 100, Remedy Drinks (organic kombucha), Mount Olympus Goat’s Kefir, HEYLIKEWOW (vitamin water), ACTIPH Water (alkaline water), Innate (organic alpine water with birch sap), CEIBA (cinnamon-infused drink), Aquamamma (hydration drinks), Voelkel (organic juices), and Jomei’s Fine Foods (nutritional lattes). While other new names – there are over 100 to choose from – include Verival Organic, MozzaRisella UK, Peter Popple’s Popcorn, Pink’s Food, The Outback Pie Company, Pegoty Hedge, Really Indian, TAQA on the go, The Organic Blending Company, Mindful Bites, Liberation Foods, Sweet Amsterdam, Greedy Goat Ice Cream, Full of Goodness, Ocean’s Halo, Bluumers Honey, East West Spice, LAZY Vegan, Nucao, Health Garden, Daveiga Seafood Crackers, Thanks for Franks, and importers Free From Italy (their brands include Pasta Lensi, le conserve della nonna, Ciemme and Probios). As in previous years, there’s a big international presence, with country pavilions from Austria, Peru, Ecuador, Italy, Greece, Thailand, Spain, and Sri Lanka (speciality teas). Over 60 other countries are participating at an individual level – bringing the sights and sounds (not to mention the aromas and flavours) of the world to ExCeL – including Australia, China, Czech Republic, Germany, India, Ireland, Japan, Poland, and Sweden. Returning show features also include the New Products Showcase – already on track to feature a record number of entries, an expanded Vegan World area (supported by The Vegan Society), and the Organic Hub, hosted by the Soil Association & Organic Trade Board – which is also around 35% bigger for 2018. “We have lots of new and innovative companies certifying with us, and this show gives them a platform for profiling their amazing new products. Natural & Organic Products Europe is a fantastic opportunity for demonstrating the range and innovation within the organic sector and has to be the main event on every organic manufacturer’s and retailer’s calendars,” says Finn Cottle, trade consultant at Soil Association Certification. The 40 companies exhibiting in the Organic Hub (up from 30 last year) range from some of the UK’s biggest to newest organic brands. Among them are Vintage Roots (distributor of biodynamic and organic wines), Googly Fruit, Bird & Wild RSPB Coffee, The Great Stuff Company, AmaVida, OrganicUK, Organic India, Playin Choc, Grass Roots, Raw Pot, Spice Root, Queenswood Natural Foods, Alpro, One Earth Organics, Mr Organic, Infinity Foods, Premcrest, Windmill Organic, Clearspring, Alara, Almighty Foods, Cocofina, James White Drinks, Heath & Heather, and London & Scottish (with its Juniper Green Gin). As in previous years, the Soil Association will also host several exclusive presentations in the Natural Products Talks Theatre discussing market trends and opportunities – including the latest consumer research and a comprehensive trade overview of the 2018 Organic Market Report. Of course, certified organic food and drink isn’t limited to just one show area – it’s up and down every aisle. Pukka Herbs, Suma Wholefoods, Tree of Life, Marigold Health Foods, Pulsin, Naturya, and CLF Distribution (organic alcohol) are just a few of the big-name returning brands back for another helping of Natural Food Show’s much talked of ‘buzz’. “The Natural Food Show is an exciting event that Pret’s food team always looks forward to attending. It’s always brimming with ideas and inspiration,” says Caroline Cromar, brand director at Pret A Manger. “Natural & Organic Products Europe is the key trade show in our calendar. It allows us to meet with the majority of our suppliers under one roof while also being able to see the latest brands coming to the market. I find it invaluable in terms of identifying and understanding the latest trends in the industry,” says David Morrin, purchasing manager at Wholefoods Wholesale. The Natural Food Show at Natural & Organic Products Europe will take place on 22-23 April 2018 at ExCeL London. The initial exhibitor list is now available to view and search at www.naturalproducts.co.uk/exhibitor-list. For more information, and to register for a free trade ticket in advance, please visit www.naturalproducts.co.uk (direct link: https://eventdata.uk/Visitor/NOPE2018.aspx?TrackingCode=PR1). Diversified Communications UK Ltd (Diversified UK) is a fast growing trade event organiser and publisher based in Brighton, Peterborough, and Nailsworth. Diversified UK’s portfolio includes Natural & Organic Products Europe; GO! Organic Festival (new for 2018); Natural Products Scandinavia & Nordic Organic Food Fair in Malmö, Sweden; Natural Products News; Natural Beauty News; Natural & Organic Awards; Casual Dining; Casual Dining Restaurant & Pub Awards; lunch! ; Commercial Kitchen; British Tourism & Travel Show; SITS – The Service Desk & IT Support Show; Accountex; Accountex Summit North (new for 2018); GEO Business; Ocean Business; MARELEC Marine Electromagnetics conference; Euro Bus Expo; and Coach & Bus UK. For more information, visit: www.divcom.co.uk.